A stylish upgrade on the brand's entry-level Cinema Screen TV - the 47LM670S - the LG 55LM960V combines passive 3D with a lively internet TV portal, engorged image processor and dual tuners: one Freeview HD, the other DVB-S2 satellite (for free-to-air Freesat on the sly). If 55 inches is just too much for your castle, the set is also available as the 47LM960V. If that's too small, a super-sized 84-inch version is on the cards. Clearly the brand has a lot of confidence in this design. The TVs key competitors are the gesture-controlled Samsung 55UEES8000 and dual-core Panasonic TX-P50VT50. 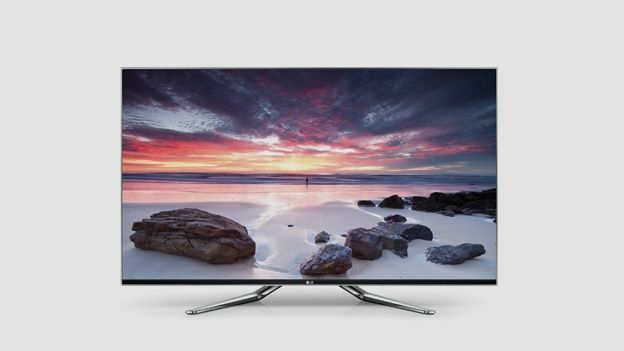 Can the 55LM960V make it into our list of the best TVs around? Whatever way you cut it, the LM960V has plenty to offer. As an internet-enabled Smart TV, it's peerless. An easy to navigate content portal is packed with catch-up and VoD services, including BBC iPlayer, YouTube and Lovefilm, and there's excellent file support from both USB and NAS. The screen can also browse a smartphone, via DLNA, and play content directly. Included in the box is the latest version of LG's Magic Remote wand, with built-in mic, to better peruse websites and play causal games. From sculptured stand to micro bezel, the 55LM960V is more art than artifice; the seamless metal edging around the edge of the TV reveals immaculate attention to detail, reflected by a user interface that's both pretty and intuitive. There are no obvious surprises when it comes to connectivity. With four HDMIs, three USBs (allowing you to dedicated one to recording to external HDD), component and legacy phonos plus PC VGA, you'll be able to hook-up most everything. Wi-Fi is also integrated, with direct connection supported. A solid bet for Olympic viewing, the 55LM960V boasts excellent motion resolution and refined SD upscaling. Be wary of motion artefacts generated by TruMotion though. The only way to escape them is to select the User mode and take De-Judder down to zero. Unfortunately LG has (once again) favoured contrast over shadow detail, lumbering the set with unyielding, thunderous blacks. It's a bit like trying to have a quiet conversation with Brian Blessed. 3D is easy to watch and relatively bright - just don't stray off-axis, because that's when the stereoscopic image splits apart. There's also a split-screen Dual Play mode for gamers, but pronounced double-imaging makes this less attractive than it might otherwise have been. Unlike lesser models in the brand's Cinema Screen range, this model uses a proprietary Nano LED diffuser plate to even out the illumination from LED clusters behind. It's not entirely successful, with obvious uniformity errors visible during darker scenes. Sonically the set is surprisingly good. The 2x10w sound system has enough weight not to irritate and the width of the display ensures a decent stereo spread. With eye-candy imagery, fabulous design and a feature spread that wants for nothing, the LG 55LM960V is clearly a premiership player. However, work needs to be done before it can claim to offer first division picture quality. Given that this TV is priced principally for footballers, it might be worth waiting for that OLED after all.